I always dreamt that I'd live in a quirky house with plenty of character, high ceilings, big windows and natural floorboards. It was always a place I wanted to call home.And after living in various places, including a flat, a three bed modern home and the quaintest little cottage ever, I honestly hand on heart, have never loved somewhere as much as I do my current place.The place I call home.The place that has natural floorboards, high ceilings, a big hallway, a bold blue door, and two beautiful fireplaces.That's my home. And I have never felt so content before. There are days when I'll wake up, with the natural light beaming through my windows and decide I want to spend the morning there. Tucked up under the throw, listening to the faint sound of traffic, as the world carries on, and I'm hiding out here. Relaxing. Relaxing in the place that I've built up, that I've made my own.And there are days when I'll come home from work, the evening sun desperately trying to stay, lighting up the room, showing every single detail in all it's glory. And I'll find myself curling up on the sofa, with a magazine or book, a cup of tea and feeling calm. Calm in the place that I feel proud to talk about, to think I did a good job of. I like my decor clean and fresh. And simple. I like minimal colour, accents of white, cream's and grey (hey, I'm from the town that never left the 1970's y'know!) with the occasional hint from green plants. But lately, I've been debating a pop of colour, some colours other than green. And I think Habitat knew. 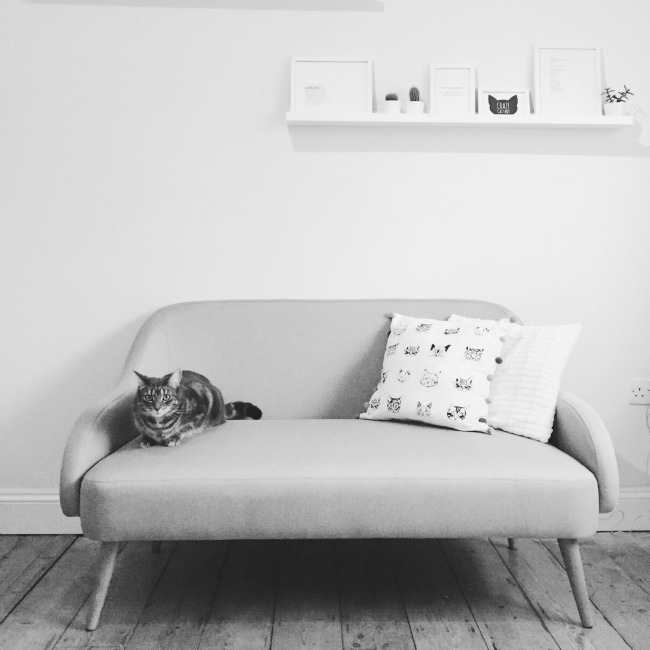 They knew what I was thinking.. And they came along at just the right time.After spending what felt like a lifetime of choosing between their gorgeous range of sofas and armchairs, I finally settled on something a little different. Something in the form of saffron yellow. And I was pleased as punch with my choice.The simple shape of the Momo sofa and it's hairpin style legs had me daydreaming about retro styles in my living room (especially after wanting this TV unit for a lifetime!) and completed with the cute armchair, adds the right amount of colour I've been looking for. I love the classic style of the sofa, the fact that it fits so neatly into my living room, keeping it clean and dare I say it, sophisticted! And I'm pretty sure that someone else is a fan of it too.. It's also freshened up my living room, making me feel a little trendier..Because trendy is good.As is Habitat. Now, maybe it's time to spruce up the living room. White bedding and a grey cat wasn't the wisest move..But it's like sleeping in a cloud.I guess some things never change!